Ozark Adventist Academy is seeking an Athletic Director, Head Boy's Dean, and part-time Assistant Chaplain for the 2019-2020 school year. More information is available via the link below. Ozark's Aerialaires Gymnastics Team's Home Show is scheduled to take place at 8:30 p.m. on April 27th in the Ozark Adventist Academy Gymnasium. 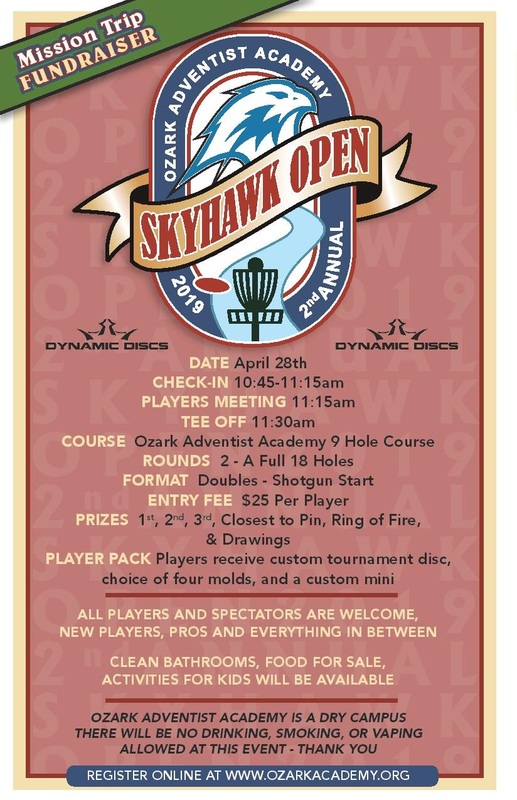 Ozark's 2nd Annual Skyhawk Open Disc Golf Tournament will be held on April 28th, 2019 on Ozark Adventist Academy's campus. 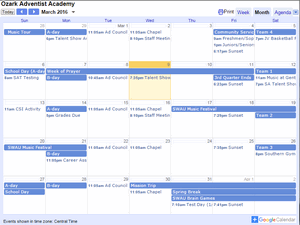 Learn more about Ozark's upcoming events with our online Calendar. Online Admissions - Apply Now! The current intramural schedule and game results are available via the link below. You Shop & Amazon Gives to Ozark! If you would like the convenience of receiving the weekly copy of "This Week at OAA" by e-mail, as well as other notifications about special events at Ozark, please subscribe below. Parents & Students will automatically receive the Newsletter through their RenWeb accounts. This weekend, April 26 - 27, students in grades 8-11, parents, and sponsors are invited to join us and discover what Ozark Adventist Academy has to offer. 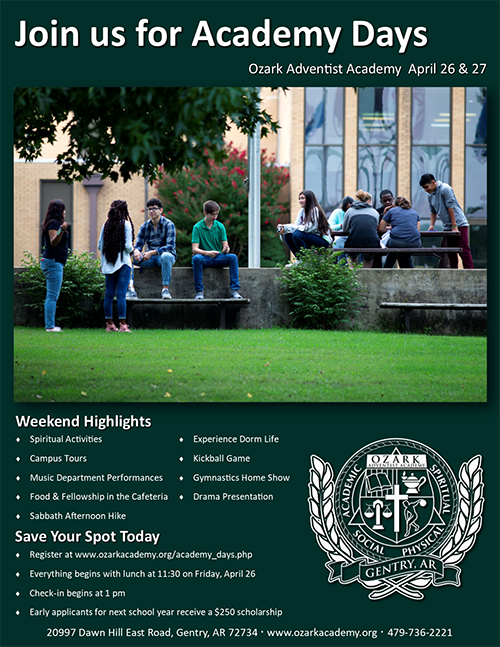 Academy Days begins with lunch on Friday at 11:30 am and Registration at 1:00 pm. The last event will end Saturday night at 10:00 pm. Visitors who do not live in the area are welcome to stay through brunch on Sunday morning. Online registration and more information about Academy Days weekend is available via the link below. The umbrellas started coming out, blankets appeared over spectators' heads, and a few cameras were put away, but Ozark and Haas Hall Academy soccer team members continued to play the second half of their game despite a bit of rain. With a final score of 2 to 1, the Skyhawks won their second game of the season. The seniors try a new way to demonstrate the demand curve and elasticity of demand in Economics class. Photo Credit: David B. We've all seen that smile before, the one that almost reaches from ear to ear. He was probably ten or twelve years old and I saw him standing over against the back wall of the gymnasium. It wasn't just the smile that caught my eye, but the excitement in his voice as he informed anyone who was listening that he was going to be a gymnast. Ozark's Aerialaires Gymnastics team performed on Wednesday for elementary students in Tulsa and Ketchum, Oklahoma. It's no wonder that young man wanted to be a gymnast after watching Ozark's students perform. From doing a flip off the shoulders of a teammate who also stood on the shoulders of another teammate, to team members flying 20 or 30 feet in the air, Ozark's gymnastics program is awe inspiring to watch. A peek into their performances, along with Ozark's drama class who also performed in Tulsa, is available via the link below. The Lifeway Christian Warriors scored first, but then Ozark's varsity soccer team scored three unanswered points to win their first game of the year by a score of 3 to 1. Peter K., Danny C., and Trey G. scored the three game winning goals but all of the members of Ozark's soccer team played a great game. Pictures from around campus on Tuesday evening. This week at Ozark, students are putting into practice the injunction found in the book of Mark "to love thy neighbor as thyself." Students who are not on the Brazil or Red Bird Mission Trips are making a difference in our own area. Ozark's students and staff have been volunteering at places such as Habitat for Humanity, Horses for Healing, the Wild Wilderness Drive-through Safari, Adopt a Highway, and several neighboring homes. 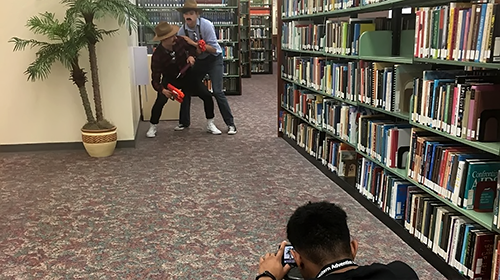 Photo Credit: David B., Bridget K., Scott C., and Donald U.
Ozark sent a team of students to Southwestern Adventist University for this year's 48-Hour Film Festival. The film Ozark students created is available via the link below. Thursday morning about 10:30 part of Ozark's student body and staff left Gentry to fly to Sao Paulo, Brazil. Those participating in this mission trip will be working on a church construction project and evangelism and VBS programs. Please keep our students and staff in your prayers. News updates from the Brazil Mission Trip are available here. Pictures from Ozark's athletic field on Thursday evening. 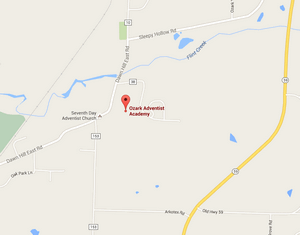 For more news from Ozark Adventist Academy visit our News Gallery or Picture Archives.